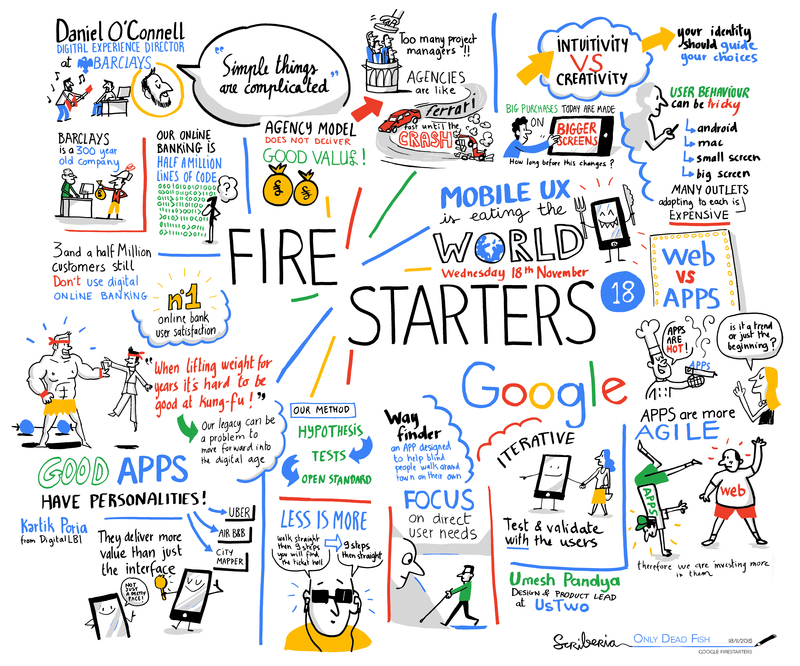 For our latest Google Firestarters event last week we focused on all things good (and not so good) in mobile UX. We'd wanted to do something around mobile for a while at Firestarters, and the opportunity to line up three great speakers to talk about what it takes to create exceptional experiences for a mobile-centric world was too good to pass up so now was a good time. Agencies, he said, often under-appreciate the dependencies within large organisations, and underestimate the time and expense it can take to navigate through design, build, system integration and testing, and also to adapt these processes to become more agile ('when you've been lifting weights for years it's hard to suddenly be good at Kung Fu'). Mobile first, said Dan, does not equal mobile only. 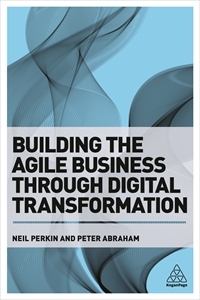 The physical parts of the existing service delivery (paper and branches) are still a fundamental part of the experience for many customers, and they still have a proportion of customers who don't use digital at all. Yet the rapid adoption of mobile and shifting customer behaviour and expectation is a positive driver of change, and an opportunity to redefine services and also ways of working. They have, for example, adopted more concurrent project working with some of their agencies to redesign services from the bottom up. Dan's talk was a fascinating insight into how new approaches, thinking, and methodologies and can not only contribute towards designing new customer-centric services, but can also bring a new level of agility to a large organisation. Kartik Poria, mobile UX specialist at DigitasLBi was a late stand-in for Chris Ball (Exec Experience Director) who sadly had a last minute client emergency (we've all had those), but did a great job of running through a series of great mobile experiences that had been crowdsourced from the UX team at LBi. Kartik drew out some broad themes from some great examples. He talked about the importance of dialogue in creating an ongoing relationship, using as an example MumsNet's pregnancy tracker app that delivers content in a timely manner and which visually changes to reflect the stage of your pregnancy. There was a nice point about apps that successfully represent different states, like the AirBnB app which, alongside an elegant, simple UX excels at presenting two user states (renting or wanting to rent) and enabling you to switch seamlessly between modes. On a similar theme, there was Citymapper's ability to assimilate large quantities of data and present it in a fantastically usable interface, and a nice example of the re-emergence of augmented reality in the Tylko app which allows you to see what furniture pieces will look like in situ before you buy. Umesh Pandya, Design and Product Lead at UsTwo, then talked us through the brilliant Wayfindr project which is the first open standard for audio-based navigation, empowering vision impaired people to move independently through their environment, and arising from a collaboration with the RLSB. Ume talked us through the rigorous user research and design process in which many of the team wore blackout goggles whilst travelling around London in order to get a true perspective on the needs of the end user. The interesting thing about Wayfindr is that it is designing for a mobile experience like no other - it dissolves into existing digital navigation services to ensure that the experience is as consistent and reliable as possible. Ume also mentioned that in order to achieve the scale of impact that is needed, they have set up the Wayfindr Alliance which is designed to bring together like minded organisations from various sectors to contribute towards the development and adoption of Wayfindr Standard. It was a fascinating and insightful talk about a worthy project. You can see the Storify from the event here, and as always Scriberia have done a great job of visualising the talks, and you can see the output in all its glory here. My thanks to Google for hosting, to the excellent speakers, and to all those who came and joined in the debate. We're moving into planning for 2016 Firestarters events now so if there are any themes that you think would be worth covering do let us know.